This fascinating holiday combines the key sights of the Golden Triangle with beautiful Shimla in the Himalayas. Experience the cultural sights of Old & New Delhi, visit the Taj Mahal & Amber Fort in Jaipur & Ranthambore tiger reserve. 3 train rides are incorporated into this holiday, including the famous Himalayan Queen 'Toy Train'. All transfers & specified sightseeing with English speaking guides included. This morning your guide will take you across the river to view the Taj Mahal at sunrise. After returning to your hotel for breakfast, we visit the much quieter Itmad-ud-Daulah - fondly known as the "Baby Taj" as this mausoleum, built to honour the grandfather of Mumtaz, was the forerunner of the Taj Mahal. Afterwards we travel 1-hour to the magnificent red sandstone royal city of Fatehpur Sikri, built by the emperor Mohammad Akbar as the capital of the Mughal Empire. The city was abandoned due to water shortage, when the capital was moved north to Delhi, and in more recent years the fort has provided a dramatic backdrop to several famous films. We then drive 15-minutes to Bharatpur Station to board the express train (air-conditioned chair car) travelling for 2.15-hours to Sawai Madhopur in southeast Rajasthan. You will be met on arrival and transferred to your hotel situated near Ranthambore National Park. This world famous tiger sanctuary was originally the hunting grounds of the Maharaja of Jaipur. 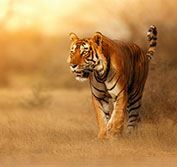 Today it is the largest wildlife reserve in northern India, covering an area of over 250 sq miles (400 sq km). We then travel 4-hours to the chaotic and colourful "Pink City" of Jaipur - home to over 3 million people. On arrival check into your hotel in this capital city of Rajasthan. Today we leave Jaipur and head northwards, travelling 5-hours deep into the interior of rural Rajasthan to the small village of Alsisar in the Sekhawati region. As this route was once part of India’s Silk Road, along the way you will see many ‘havelis' - luxury mansions of wealthy merchants, with magnificent frescoed walls with intricate carvings and ornate designs. Although many of these are now abandoned, some have been lovingly restored and are now heritage hotels. Today we leave Alsisar and travel 5-hours through rurual India to the bustling city of Delhi. Check into your hotel in this bustling modern city. This morning transfer to Delhi Railway Station in good time to board the 07.40 express train (air conditioned chair class) travelling 4-hours to Kalka in the foothills of the Himalayas. A packed lunch will be provided. On arrival in Kalka, change trains onto the narrow guage Toy Train, travelling 5-hours through beautiful scenery to Shimla. One of India's five 'toy trains' built by the British, it is registered in the Guinness Book as the greatest narrow gauge engineering achievement in India. The train passes through breathtaking landscapes of the majestic Himalayas - with 103 tunnels, 969 bridges, 919 curves and over 20 railway stations along the way. Enjoy splendid views of the snow-clad Himalayas, covered with thickly populated pine and oak forests. Arrive at the hill station of Shimla in the late afternoon, where you will be met and transferred to your hotel. Referred to as the "Queen of Hills", Shimla was the summer capital of British India and is steeped in colonial history. On arrival check into your hotel and relax in the fresh mountain air. At leisure to relax at Shimla in the foothills of the mighty Himalayas. Today transfer 3-hours to Kalka Railway Station stopping along the way for lunch (own account). Arrive in good time to board the 17.45 express train travelling 4-hours to Delhi (air conditioned chair class). You will be met at Delhi Railway Station and transferred to your hotel situated near the airport.